I've tried to sell this 40 yr. old high chair at about 4 garage sales. I took it out of the last garage sale and decided it would become my next mixed media project. Today, I got a bit of collage and paint on it, and I think I'm going to like this project. I will also use lettering and stamping on it. My plan is to use it as an outdoor plant stand, but it works well as a youngster's chair, so maybe my granddaughter can use it when she visits in August. The papers I'm adhering are scraps I've had around my studio for awhile....hopefully I can maintain the basic colors throughout the whole chair. I may end up doing layers and layers, introducing new colors if I run out of the current scraps. I'm liking the turquoise on the top of the spindle back and the tips of the arm rests. 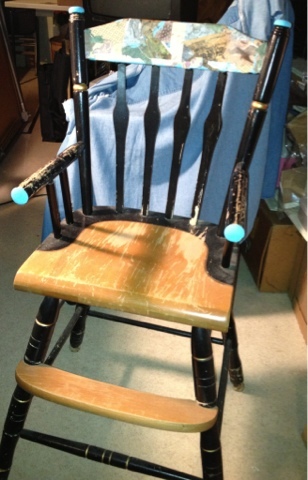 I may leave the gold as is in various places on the chair. For now, my thought is to cover all the black and leave the light wood showing, but I may end up covering that too. Any suggestions? Stay tuned for the final results -- hopefully within a few days. 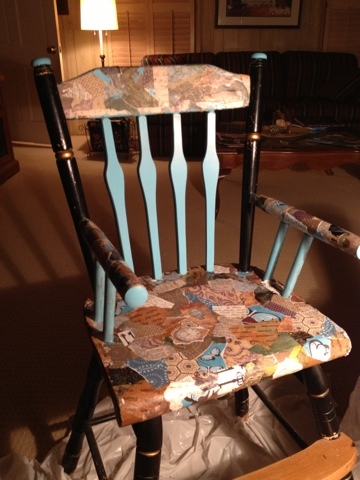 I added another photo to this post - more of the chair is collaged. Trying to figure out if I will write on top of the collaged papers, add a drawing....we'll see.